Synopsis: It’s Groundhog Day. Well, sort of. It’s a lot less funny and a lot more scary, even when your four ex-best-friends are in it with you. It’s been a year since graduation; a year since Beatrice’s boyfriend Jim died under mysterious circumstances deemed a suicide, with his body found in a quarry near their exclusive Darrow-Harker School. It’s been almost that long since Beatrice has seen the rest of the members of their group, but out of the blue she accepts an invitation from her former best friend Whitley to join them at her family’s estate up the coast, Wincroft. Beatrice is sure they’ll know something more about Jim’s death, and she’s ready to find out. Problem is, while they’re all there, the five of them end up stuck in a time loop—a splinter, according to the mysterious Keeper who shows up at the door of the estate. Each time the time loop ends, they have to vote—and AGREE—on who gets to survive and live on, because only one of them can get out of the time splinter alive. Observations: There are multiple sources of suspense in this one: Beatrice’s quest to find out what happened to her boyfriend Jim, and also the group’s repeated attempts to foil, fake out, or otherwise exit the time loop. Each day, something different happens, except when it doesn’t. And each character copes differently: Kipling (the one character I was a little less sold on, because I couldn’t buy his character quirks) and his drinking and attempts at suicide; Cannon the computer genius, who disappears for days at a time; Martha, the odd one, who brings her considerable intellectual faculties to bear; and Whitley, who seems determined to party and commit mischief until the end of time. 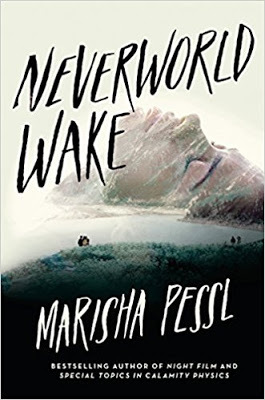 I’d only read Marisha Pessl’s book for adult audiences, Night Film, which was both strange and suspenseful as well. This one combines elements of the supernatural and time theory with the classic page-turning greed of a thriller. Despite a few lingering questions about the how and why of it all, I ended up enjoying this one quite a bit. Conclusion: If you’re looking for a fast-paced, exciting, dark thriller, and aren’t put off by hints of the supernatural, then you might enjoy this one. Also, fans of timeslip, time travel, and alternate universe fiction should give it a try. I received my copy of this book courtesy of my library’s ebook collection. You can find NEVERWORLD WAKE by Marisha Pessl at an online e-tailer, or at a real life, independent bookstore near you!